Usually, when people select a scheme themselves, they do so based on its performance. They don’t consider that past performances may not be sustained. Evaluation of schemes is a function of various attributes of the schemes, e.g. scheme objective, investment universe, the risks that the fund is taking, etc. This requires the investor to put in time and effort. The investor also needs to have the requisite expertise to be able to understand the features and nuances as well as the ability to analyse and compare from among many options. A distributor of mutual funds or an investment advisor would be qualified and trained for such a job. Secondly, more important than investing in the best scheme, it’s important to invest in a scheme most appropriate or suitable to the investor’s current situation. Though the investor’s situation is best known to the investor, a good advisor or distributor would be able to ask the right questions and put things in perspective. Once the portfolio is constructed, regular monitoring of the scheme characteristics and portfolio is required, which is an on-going job. 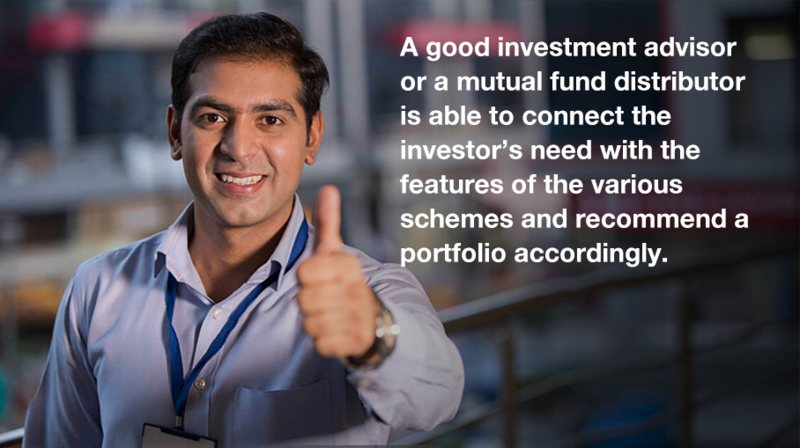 An advisor/distributor helps you review these schemes too.